This week it felt like “need” was the word of the week. “I need this,” “I need that,” “I need Juan Pablo to say…” “I need to know how he feels,” “I need him to know how I feel.” NEEDY NEEDY!!! 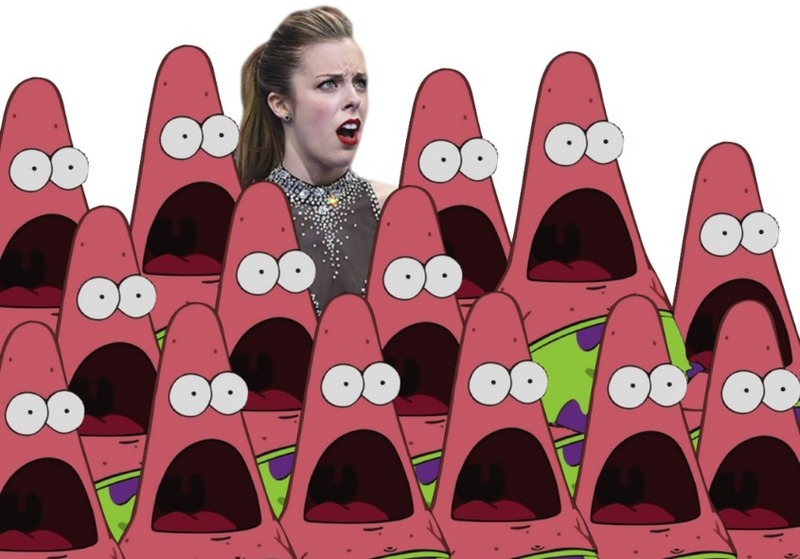 Andi, I want you to know that Ashley Wagner, many Patricks’ and I are disappointed in your cliche-ness. Cassandra, Chelsie, Kat, Renee, Sharleen, and Nikki go on the group date. It’s Cassandra’s birthday today! She’s 22!! It’s been legal for her to drink for a FULL YEAR NOW!!! He “tricks them” in to believing they’re just going on a picnic and then SURPRISE!!! We’re all jumping in giant, blow-up hamster balls, and rolling down this hill! Boy, is it a good thing these girls got bathing suits! All in all, the hamster balls actually look pretty fun. This season, any encounter with balls that doesn’t end in a tearful, ‘that was a mistake’ conversation I’m going to count as a success! We move on to the cocktail party and everyone gets some alone time with Juan Pablo. Nikki says she’s falling, Sharleen says it feel inorganic, and Cassandra DOESN’T mention it’s her birthday. Big Mistake, princess! Cassandra stumbles through a conversation about how much he means to her, and how nice it is to FINALLY have these feelings again. Because, you know, at 22 it’s been so long since she felt butterflies. The last time was probably, like Prom night, or something. Sharleen gets the rose, and Juan Pablo asks to speak with Cassandra again. He gives her the ultimate un-birthday present, a very long trip home!! Kudos to Juan Pablo for not leading her on since she has a kid. I hope for Cassandra’s sake she gets butterflies again before she turns 23! Clare gets the last one-on-one date and it starts with her bringing up the mermaid make-out sesh that led to a dance with no pants. Clare, I want to give you a tip, just like Juan Pablo did (I promise I’ll stop with the innuendos). Stop bringing it up! He wanted to spend time with you, just you! Go with it. Having said that, so far I’d do the opposite of pretty much everything you’ve done and you’re still there. So, keep doing you, I guess. They make out by the water, and then they go back to Juan Pablo’s place to just hang out, like a normal couple. A normal couple who hang out in a hotel room, on an all-expenses paid trip, to New Zealand! My level of disappointment cannot be explained. She gets in his pants again. His sweatpants, I mean. They hang out in the living room, in sweats, all comfy cozy. She gets the rose and I feel like dry-heaving. So Kat goes home, she plays the “I always here I’m such a catch, but here I am still single” card. She’s a nice enough girl, I just don’t think Juan Pablo is the one for her. So another week is in the books, and we’re that much closer to Juan Pablo’s sensational selection of a soulmate. See you next week! !